Pune has ample of cafes that are pretty and perfect to while away the day at. 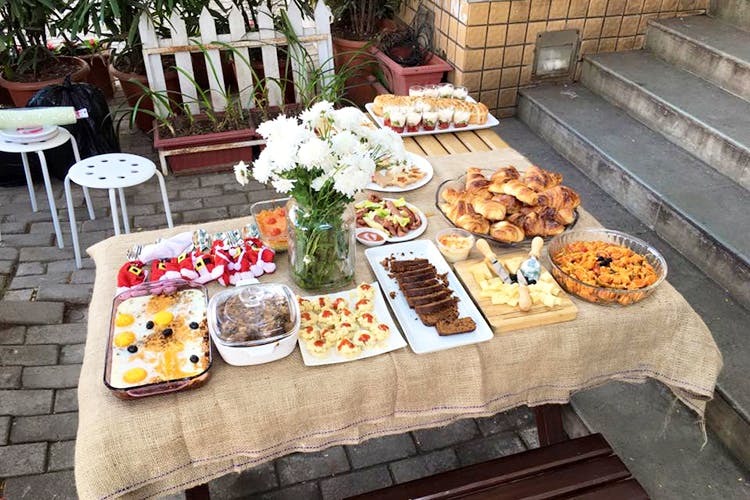 The French Window Patisserie in KP is ideal to work out of, read at, have a quick lunch meeting at or to go to for breakfast or brunch on a lazy day. A quiet bungalow in KP’s lane 5, the cafe is very Parisian in decor. Antique white garden chairs and a glass display full of sweet goodies is what you should go for here. There are some nooks you’ll find, but it’s obviously best to sit outdoors, and enjoy the green and quiet around you. If you’re here to grab breakfast, choose from eggs-to-order to freshly baked croissants. For those hoping to grab something healthy, porridge and granola bowls are available from 9.00 am, until 12.30 pm. Try their classic Parisian Eggs Benedict – a butter croissant served with poached eggs, smoked salmon, topped with Hollandaise sauce. If you’re here later in the day to grab dessert or are a sucker for sweet breakfasts, you could indulge in the apple-pie pancakes, and meat-lovers could enjoy their cheesy meat-fest omelette with a side of toast and some salad leaves. If you take your coffee seriously, you’ll love their manual-made brews available in aeropress, French-press, and pour-over. There’s a lot you can eat, sure. But the entire bungalow is a gorgeous setting that it isn’t hard to forget that you’re in Pune. A meal for two will cost you INR 600 here and you can grab a quick lunch here sometime too. The cafe also offers free WiFi and is pet-friendly. So, guess where you’ll find us working next. Try some classic French sandwiches like croque monsieur or croque madame. Also bite into French baked goods like pain au chocolat, quiches and pick up a brioche or two for home.